When I first saw that the biography of Maran HaRav Ovadia had been published, I thought, “Nah, this book isn’t relevant to me. He was Sephardi, I’m Ashkenzi. Nothing doing.” But I decided to give it a chance anyway and, whoa, am I happy I did! You can read my full review of Maran HaRav Ovadia on my blog. Rabbi Heimowitz did an amazing job gathering information on many aspects of HaRav Ovadia’s life. The quotes from friends and family throughout the book gave me a feeling of closeness to HaRav Ovadia. I especially enjoyed reading how HaRav Ovadia related to his grandchildren. Although he was involved in the klal and constantly learning on his own, HaRav Ovadia still made time to sign his grandchildren’s report cards and make sure they were advancing properly. In one case, a grandson was behind in his studies, and HaRav Ovadia arranged for a tutor and also reviewed the material himself with the child. To get back to the personal relevance, I was awed by the stories of hasmada, highlighting how much a person can push himself and be able to accomplish. HaRav Ovadia lived through many hard times, going from living without plumbing in Egypt to living in Israel during wartime. HaRav Ovadia served as a Rav to many, becoming a dayan and then the Rishon L’Tzion, Chief Rabbi of the Sephardic community in Israel. After that, he became involved in the political party Shas. Being involved, the book explains, meant that he accomplished everything required in only 10 minutes a day, devoting the rest of his time to Torah study. Sometimes the book read like a thriller, as one very exciting story began in Egypt, but then followed the Ovadias to Eretz Yisrael. It started when HaRav Ovadia was delving into the shechita (or, rather, lack of it) situation in Egypt. To avoid financial loss, many butchers had been taking shortcuts, which is 100 percent forbidden by Torah law. HaRav Ovadia made it very clear that proper shechita is not something the Jewish nation compromises on. Well, not everyone took that so easily, to say the least. One such shochet would not leave his profession, no matter how many warnings he was given. On several occasions, he even tried to have HaRav Ovadia killed so that the shochet could continue to selling non-kosher meat In the 1950’s, when the Ovadias were already living in Petach Tikva, this same man’s name came up as being a practicing shochet in Mevaseret Yerushalayim. It didn’t take long before this evil man learned that HaRav Ovadia was once again foiling his plans, and he threatened HaRav Ovadia, who was compelled to call the police to investigate. Much later, Rav Yaakov Ovadia, HaRav’s oldest son, read that the man had been murdered by a fellow criminal. The part of the story that most impressed me was HaRav’s determination and dedication to the Torah even when his very life was at stake. Maran HaRav Ovadia is well over 500 pages, but by the end, it is clear that the life of a gadol can hardly be described in such a short piece. This is a book that I highly recommend for each Jewish household. It’s something that can be read a chapter or so at a time and enjoyed at each reading. We love to hear from our readers! If you have an opinion or review to share on one of our books, please email blog@artscroll.com, and you could be featured here. He had a mind big enough to master all of Torah. A spirit big enough to lead his people. And a heart big enough to contain all of Klal Yisrael. 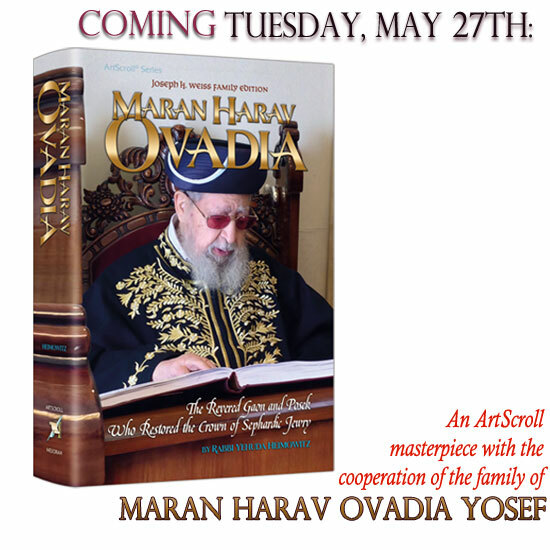 The highly anticipated biography of Maran Harav Ovadia Yosef is due in stores on Tuesday, May 27th. Click here for book details and to preorder your copy.